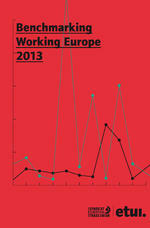 Benchmarking Working Europe is one of the ETUI’s regularly appearing flagship publications. Issued annually since 2002, the report offers an alternative perspective on EU developments. Using publicly accessible data, it reveals what is actually going on behind the EU social and economic affairs headlines. After last year’s issue focused on growing inequality in Europe, this year’s Benchmarking Working Europe report will demonstrate by means of hard-hitting graphs and cogent arguments that Europe is, rather than converging, actually drifting apart in numerous respects.